With Patient Access, you can now view, book and cancel appointments at your local GP surgery from home, work or on the move – wherever you can connect to the internet. What’s more, because Patient Access is a 24 hour online service you can do this in your own time, day or night. Plus Patient Access can also be used to order repeat prescriptions. Your prescriptions will still take 2 working days before they are ready to collect. You must be a fully registered patient, over the age of 16. 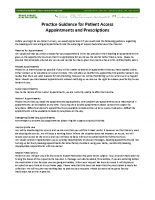 You will need to complete a Patient Access Application Form and read the Practice Guidance Notes. Once completed show reception some photo ID i.e passport/driving license together with a utility bill, bank statement. 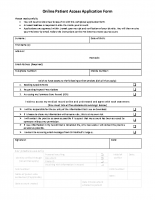 You will be provided with your own unique registration letter. Click on this link https://patient.emisaccess.co.uk to register and follow the simple log-on instructions. You will be asked to create an account. When prompted enter your personal login details which will be on your unique registration letter. You can then register and use our online services. All information that is sent to the surgery via Patient Access is secure. Your personal details are encrypted and protected using the highest standard internet security, so it cannot be intercepted. Only you and the GP surgery are able to see this information.